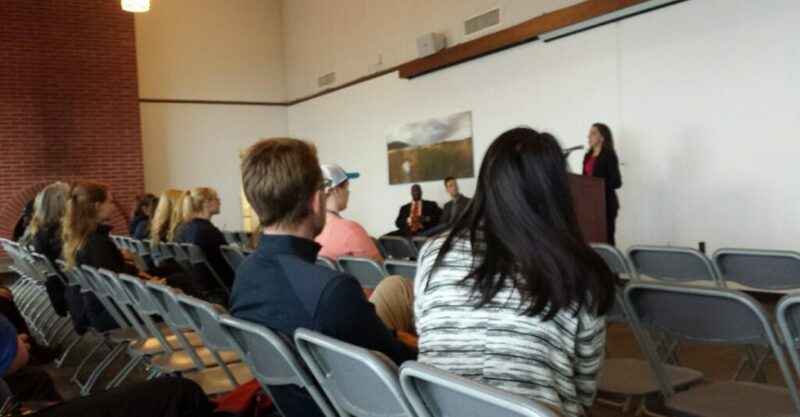 Rebecca Barboza, Department of Fish and Wildlife biologist, provided students, faculty and staff with more contextual information regarding mountain lions during a session on Feb. 10 in the Fireside Room in response to the recent multitude of mountain lion sightings. Barboza spoke at the session about traits of mountain lions and how to identify and defend oneself against mountain lions. Barboza said the presence of wildlife does not necessarily make them a public safety threat. Barboza said relocating the animal would be ineffective because mountain lions have distinct home ranges of about 100 miles, so the animal would just return to the area after being moved. Barboza said to walk with at least one other person at night, as there has never been an instance of a mountain lion attacking a group of people. Most attacks are a result of the mountain lion mistaking a human for something else, as their primary prey are deer. It is useful to have a strobe light or a phone with a strobe light and sound in case of a mountain lion encounter, Barboza said. DPS Senior Lieutenant Eric Barnes confirmed that DPS officers have gotten up to 10 to 15 feet away from a mountain lion before it ran away. Freshman Kelly Nolan said she did not attend the session, but saw a mountain lion while walking to Peppers House last week. She said she was on the path behind the dorms when she saw the animal run across the path, down to Lower Dorm Road. However, she did not report the sighting to DPS because she was reluctant to call after having to call DPS for assistance the week prior. Nolan said she thinks the animal is definitely comfortable around humans, as it has been unafraid to traverse near the dorms and living spaces. Freshman Drake Swift said he is not overly concerned about the mountain lion and did not attend the informational meeting Feb. 10. However, Swift said he thinks DPS could be doing more to protect the campus. The more mountain lions are reported in the media, the more sightings are announced, Barboza said. Barboza said to share any mountain lion sightings or information with DPS through the LiveSafe app and take photos of the animal, if it can be done safely.